This post is from contributing writer Mary Voogt of Homemade Dutch Apple Pie. I’ve never been that crazy about Halloween. Don’t get me wrong, getting dressed up is fun. Spending time with friends is great. Of course as a kid the candy is the real star of the show. But on the whole it’s more of a hassle than anything, especially as a parent. Scrambling to find a costume (I’m cheap and just get creative with what we have on hand…anybody with me?). Spending half the week’s grocery budget on junk food for the neighborhood. Not my cup of tea. But there is one part of Halloween and fall in general that I have always loved. I liked the taste. But more than that it reminded me of my grandparents. They lived on a farm and always kept a chicken feeder on the kitchen table to feed their little chicks – their grandchildren! For some reason I was more into this tradition than any of my siblings or cousins. If my grandparents knew I was coming they were sure to stock it with candy corn for me. I ran to it first thing when I entered the house to check and have a little chicken feed. My days of visiting the farm are coming to an end as my grandmother passed away earlier this year and my grandfather is in hospice. But when I do get there the chicken feeder is still sitting there on the table as soon as I walk in the door. I am honored that it will soon be the centerpiece of my own table! I can carry on the tradition of feeding my kids and someday grandkids just like little chicks. My candy corn will not come out of a bag. It will not have artificial flavors and food coloring. Instead it will be full of nourishing, grassfed gelatin! 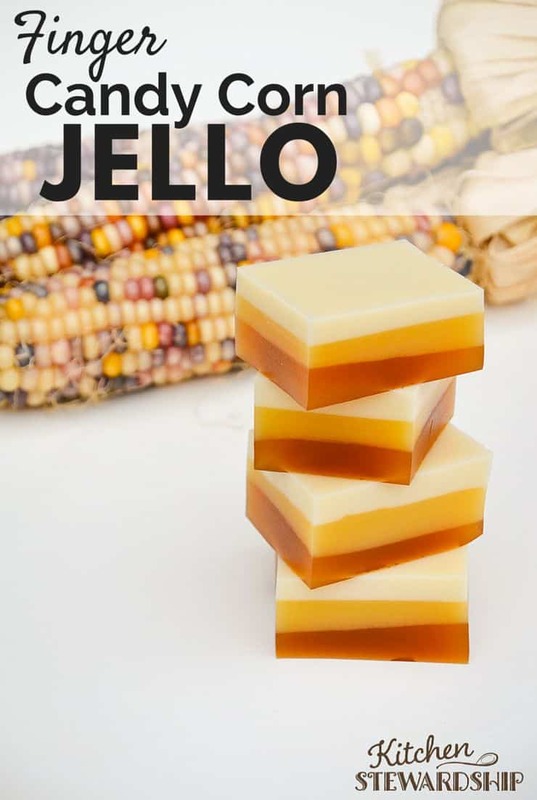 Candy corn finger jello is the perfect way to get into the festivities without sacrificing nutrition. It has bright, fall colors and a burst of flavor. Plus it can still be eaten with your fingers (though it won’t be stored in the chicken feeder!). Add to that easy-to-digest protein in the form of gelatin that is both healthy and healing to the gut. Not a bad idea when consuming a bit of extra sugar. This post is sponsored by Vital Proteins, the brand of grassfed, top of the line gelatin (use the coupon KS10 for 10% off!) in the Kitchen Stewardship house. Use the code VPKS10 to get 10% off your order! 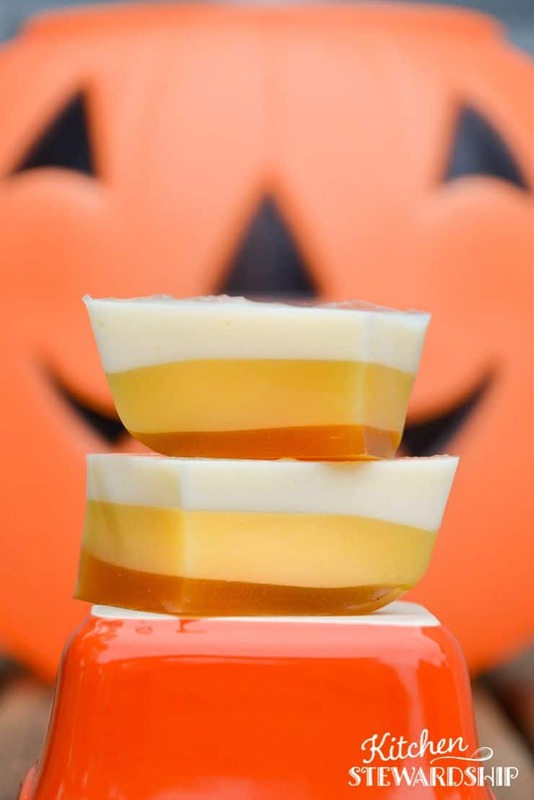 A fruity homemade spin on candy corn using gelatin (use the coupon KS10 for 10% off!). Combine all of the bottom layer ingredients in a small saucepan and whisk to combine. Turn on heat to med-low and gently whisk until the sugar and gelatin dissolve and the mixture is completely liquid (this takes 2-4 minutes). 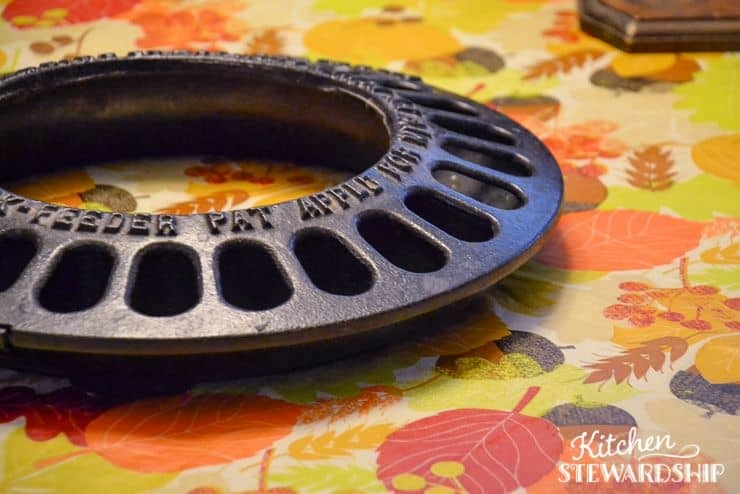 Pour the mixture into an 8″ or 9″ square glass pan or fill candy molds 1/3 full. Chill in the refrigerator until firm (about 20 minutes). You can also chill it in the freezer to set faster. 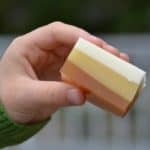 Repeat this process for the remaining two layers, making sure the previous layer is set before pouring the next layer on. Cut into squares or remove from molds. *Any milk/dairy substitute can be used in place of the milk and yogurt. *The blueberry juice is used for color in the bottom layer. You can leave it out if you don’t have any. It just won’t be quite as dark/contrasting. *Cane sugar gives a more neutral flavor and allows the fruit flavor to come through more. Honey will give a stronger, sweetener flavor. This finger jello will fit right in at school parties. You could even host your own Halloween gathering in place of trick-or-treating and serve a variety of homemade goodies like chocolate covered toffee, maple candy and gluten free pumpkin spice graham crackers. 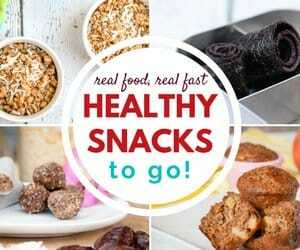 It also makes a fun treat for school lunches this time of year. 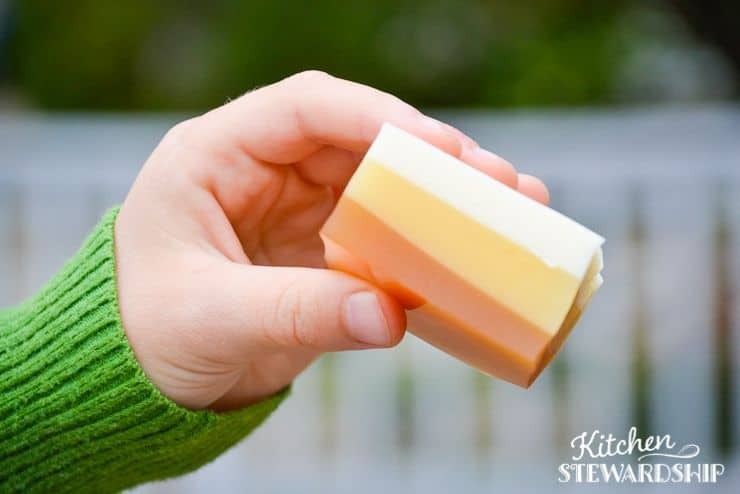 As a parent I love that candy corn finger jello is so easy to make and can be prepared ahead of time. Each layer only takes about five minutes of hands on time. Just what you need when you’re busy with kids and lots of interruptions. Make each layer as you have time – even hours apart! This jello can be made with dairy or coconut milk. Or if you’re like my family and have kids with allergies to both you could substitute whatever dairy replacement you tolerate. We usually let our kids swap their candy for money after trick-or-treating. But it sure is nice to be able to let them indulge in a treat too! Are you looking for a brightly colored Halloween treat that your kids will love and you’ll feel good about? 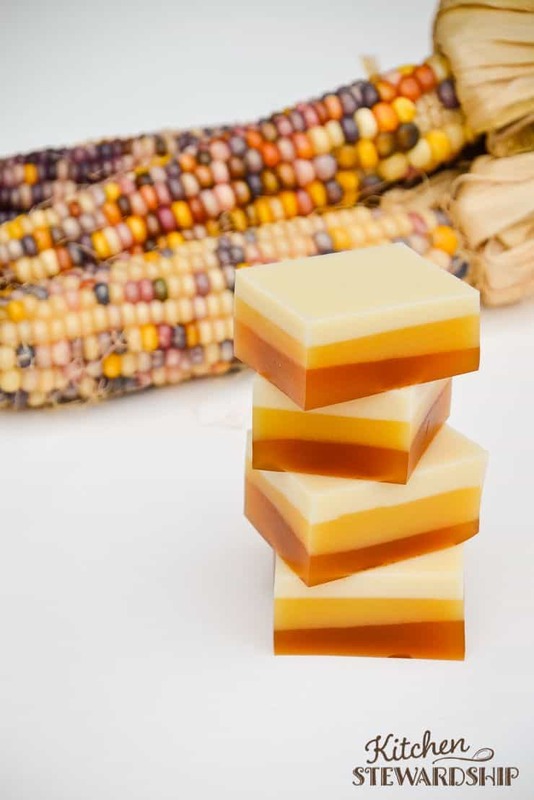 Make a batch of candy corn finger jello. Serve it as a snack, dessert or even with your dinner on Halloween! Want to really wow your kids? Instead of making the jello in a pan use candy molds in whatever shapes you like. It will take a few extra minutes to pour into the molds. But it will make an impressive homemade treat. Feed your little chicks something healthy and full of nourishing Vital Proteins gelatin (grassfed!) this fall. 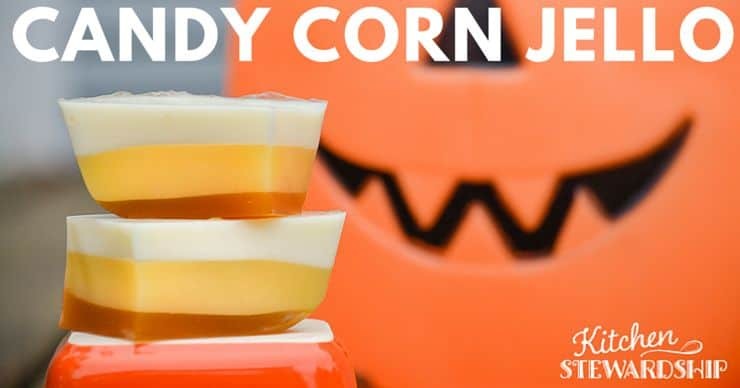 Candy corn finger jello will be the new star of the show. So glad it worked out for you, Justine! 🙂 That’s also a great brand of real-food gelatin to use – we just were highlighting one of this month’s sponsors since we love their product, too. So glad you enjoyed it, Justine! Yeah, sometimes if it’s too hot it can melt into another layer. When you are heating the mixture it doesn’t need to get hot, though. Just warm enough to dissolve the sugar and gelatin. Maybe keep the heat lower next time.